The WordPress Evolution - What’s in Store? The WordPress Evolution – What’s in Store? Do you remember your first encounter with WordPress? For many of us, it all began with a simple hello – “Hello, world” that is. Who would have thought that this simple blogging platform would evolve into the powerful content management system (CMS) that it is today — with over 65 million WordPress sites all around the world and currently dominating more than 50% of the Technorati Top 100 Blogs list. (source: Royal Pingdom) If you are currently a WordPress user, then you could say you are in pretty good company. In a span of 10 years, the WordPress platform has become the platform of choice by familiar web bigwigs such as Mashable, TechCrunch, InfoWars, and Wired to name a few. Although blogging has evolved and branched into so much more than just an online repository of personal commentaries, it still is central to the whole WordPress experience. In an interesting article by Morten Rand-Hendriksen, WordPress at 10: Time for a Fork , the author shares some valuable insight and analysis that will make you stop and think. “In its quest for broad appeal, WordPress is becoming overgeneralized. I fear this may erode its foothold on the web and in the end break the application as a whole. … WordPress is not really a CMS but rather an extremely built-out blogging platform. And because a large number of its users are bloggers, front end features are constantly added to help them. At the same time, new CMS features are added on the back end, allowing advanced developers to plug in and hook up. There are other contributors (John Saddington of WP Daily, WPTavern, etc.) to the discussion and what’s great about being part of the WordPress ecosystem is that we all can participate and contribute to make this valuable open-source tool more responsive and beneficial to the whole community. 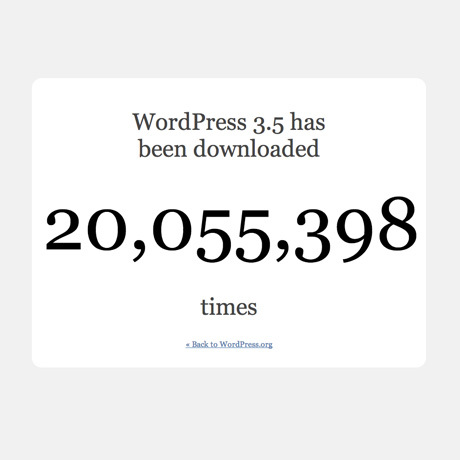 As WordPress celebrates a decade of revolutionizing the web — authors, developers, users, and all those involved in its continuing evolution have the power to create an impact that will affect WordPress users decades from now.